Small Bathrooms are a great place to showcase high-interest countertops. This counter beautifully illustrates Verde Marinache (also called Verde Marinace Granite) granite’s elegant and complex coloration and larger-scale pattern. Add a vessel sink and you have a very current yet classic look. 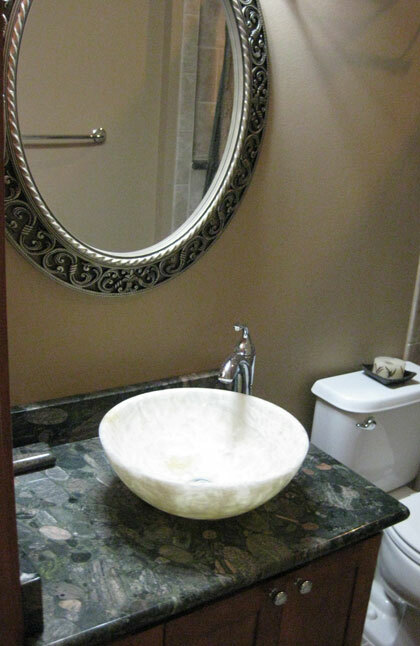 Toluca Granite stocks a wide range of small pieces (granite remnants), one of which may be perfect for updating one of your designer bathrooms! Whether your Austin granite project is big or small – call Toluca Granite for the best pricing and the best selection of granite and marble for your home.